Forty-six desalination plants in Texas turn salty water drinkable. None, however, is located on the coast. All are inland and use brackish water. As fresh water grows scarcer, the hunt for new supplies is expanding outward, to sources formerly on the margin. Brackish water, less salty than the sea but still too salty to drink, is the latest target. With abundant brackish groundwater resources, Texas is a national leader in the use and study of this emerging resource. Texas’s fleet of desalination plants will grow in 2016. In October, San Antonio will open the first phase of what will be the world’s largest inland desalination when all three phases are completed in 2022. 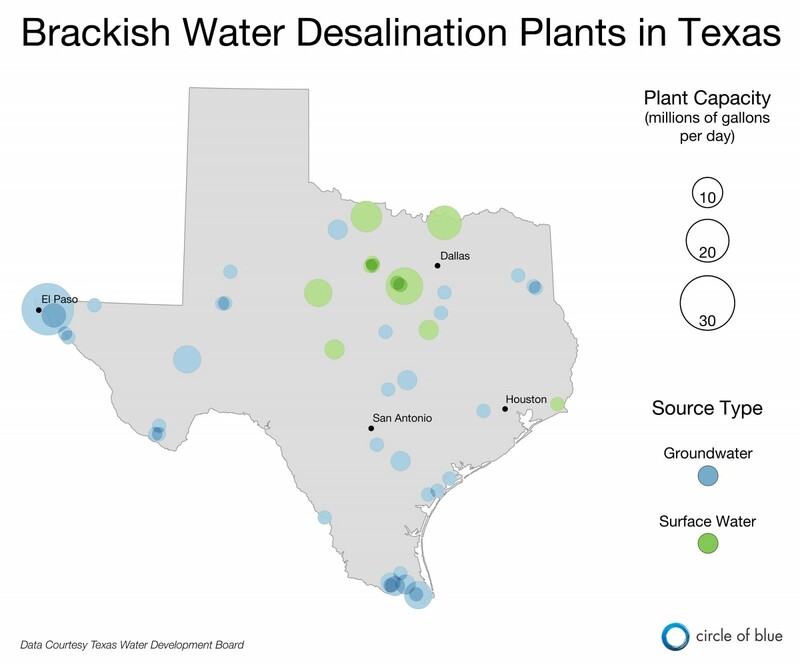 The graphic below shows the location and capacity of the brackish water desalination plants in Texas and whether they use groundwater or surface water. Texas has 46 desalination plants, all of which use brackish water, which is less salty than sea water — and less expensive to purify. San Antonio will open the state’s newest brackish groundwater desalination plant in October 2016. Click image to enlarge. This graphic was made to accompany the article 2016 Preview: Brackish Water Takes a Star Turn by Circle of Blue reporter Brett Walton. Contact Brett Walton or by @waltonwater on Twitter.